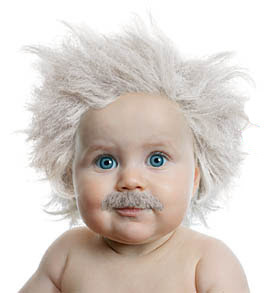 John's Universe: Baby Einstein and Brainy Baby Videos No Good for Your Baby? Baby Einstein and Brainy Baby Videos No Good for Your Baby? Trien and I want to give our soon to be born daughter every developmental advantage we can. Not that I want to churn out a female John Stuart Mill or anything like that. We just want to develop her natural gifts and interests, without putting any pressure on her. The first thing I did was to download a baby sign language book off the Internet. Later on, my sister sent us baby sign language flashcards. Bay sign language is supposed to be a great help both to baby and the parents, in that you can communicate with each other before your baby can speak. My brother and sister-in-law taught sign language to their daughter, and she is 20 months now and is very advanced in her language skills. She can speak and understand both Mandarin and English. They both swear that teaching her sign language greatly sped up her development in this area. The next thing we have done to help our daughters development while she is in the womb, is that we have been playing classical music since about the 23rd week of pregnancy, when she first showed signs that she responded to music. We have some Mozart, and I have Beethoven, some Bach, and other classical music I am going to burn onto CD for our little Melody. One of the reasons we picked out the name Melody for her is because she seems to enjoy music so much. When we play music, she seems to start dancing in Mommy's tummy. Finally, I have bought these "Baby Einstein" videos, which seem not to be real Baby Einstein videos, despite their official looking seal and packaging. One of them looks pretty professionally done, and might be the real thing, but the other two look like someones home videos with musical accompaniment. It looks like they spent all of $2 for the actors and production costs. Which Is less than the RM 20 it cost me to buy them. Anyway, I did download the real thing at the Internet cafe here, and these look legit. I was already to burn them onto CD, until I read this article. Now I don't know what I am going to do. I didn't know that pediatricians recommended that children under two not watch TV. OK- that means these videos and other of the same ilk are not recommended for use. But now, according to the article, there is legitimate research in The Journal of Pediatrics that says these videos can actually retard your baby's language development? YIKES! I will have to do more research on the subject. In any case, I think the time would be better spent playing with Melody, and making faces with her, than watching videos. What the hell! Into the trash, and erased from the hard drive they go! If that's true, the "Baby Einstein" videos I bought are destined to become Frisbees, decorations, or coasters. It seems like they'll be more useful that way.